In London, leaving a tip is appreciated but not always customary or appropriate. It is typical in restaurants, but the ultimate rule is the same as elsewhere: the amount of the tip is at your discretion, and it depends on the service quality. People in London are not into as much pressure to tip service workers. However, we still recommend it as best practice that you tip, especially for exceptional service. We also advise that you tip in cash and hand it over personally to your server, driver, or whoever directly served you because in some places, tip money goes to the company, especially when paid via credit card. Many hotels already include a service charge of typically 10% in their bill. The same goes for restaurants in hotels. If you do not see such an item in your bill, do leave a tip of 10% to 15% of the total amount. Housekeeping staff are typically tipped when the guest leaves. You decide how much to give them. Porters are nearly always tipped. Doormen, concierges, and other staff are also tipped but not as often as porters are. When eating out, the standard percentage left as tip is between 10% and 15% of your total bill. Take note, however, that some restaurants already add a 12.5% (typically) gratuity charge on your bill. This is more commonly done for big parties. Your waitstaff may or may not personally receive your tip, especially if you are tipping by credit card. Londoners do not generally tip in pubs. Sometimes, bartenders return change on tipping trays, in which case you are still welcome to leave some tip. Other times, you can give the bartender the cash tip and utter “and one for yourself” or say “keep the change when paying for your drink. Fast food, takeaway meals, and self-service dining places are not given tips. In cafes with table service, tips are very much appreciated. The “keep the change” principle usually applies. Sometimes, patrons give 1 to 2 pounds. Cafes without table service sometimes have tip jars on the counter. In this case, tips are neither expected nor required. There are different types of cabs in London, and tipping is customary for licensed minicabs and black cabs. The percentage ranges from 10% to 15% of the total fare if you want to be polite. However, most locals will just round up their fare to the nearest pound and let the driver keep the change. Drivers who assist with luggage may be tipped as much as 5 pounds or more. If you have had a particularly enjoyable tour, you can leave a tip of 2 to 5 pounds for the guide. If you are a large group, the average amount is 1 pound per head. Guides on long coach tours are tipped generally together with the coach driver. The standard amount here is 1 to 2 pounds for each day you are on the tour. These amounts can still change, depending on the length of the tour. The standard tips for guides in other activities may also vary, depending on the nature and the duration of the activity. Attendants and service providers in spas are not customarily tipped. However, many experienced travelers suggest that you always tip such workers. Hairstylists and other staff in salons generally do not expect tips, but people give 10% on average for an exceptional job. These are oftentimes given to the hairstylist themselves, but you may also tip the person who washes your hair or blow-dries it. There are numerous public bathrooms in London, and while some of them do charge a fee, you do not have to pay anything more than that. Meanwhile, clubs and bars sometimes have attendants manning their bathrooms. These employees sometimes offer sweets or other products for some added cash. Do pay for any product you take from them. Tipping in London is not much different from that in other countries. The standard amounts differ by sector, but the rule remains the same that great service must always be rewarded. Always remember to have some spare change with you for tipping. 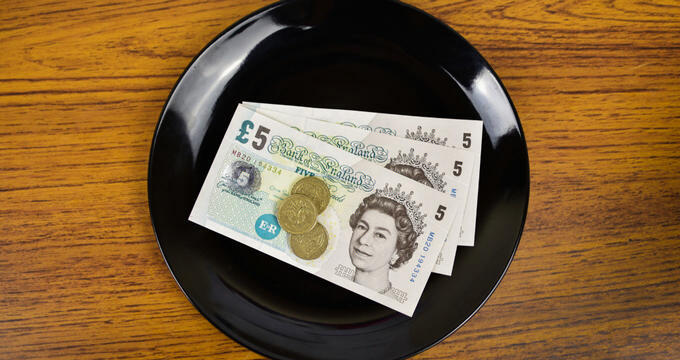 It would also be great if you could tip in pounds instead of your own currency so that your server does not need to have it converted, which may even lead to additional charges on their part.